I like wearing tights. 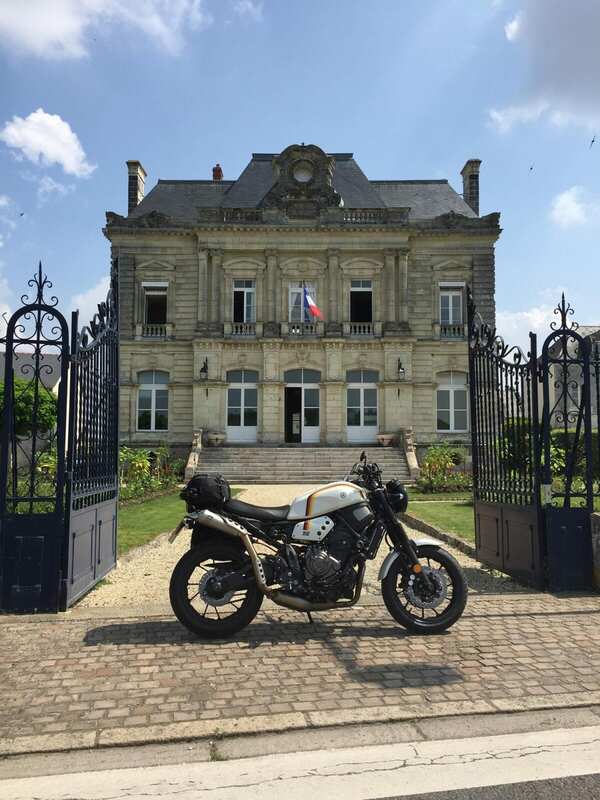 The discovery was born of necessity, but it’s just one of the things I learnt on the ride from Lincolnshire to the Wheels & Waves custom bike festival in Biarritz. Less controversial maybe is the fact that the XSR700’s 74bhp, 50lb-ft motor – the same 689cc motor found in the MT-07, and as will be in the touring-focussed Tracer 700 that I’ll be testing as you read this – is incredibly capable, whatever’s thrown at it. Cada Día as I’ve called this bike (‘every day’ in Spanish) may be a custom, but besides the Akrapovič exhaust system (which makes no real difference to performance – see the June issue for full dyno figures), the engine is standard. 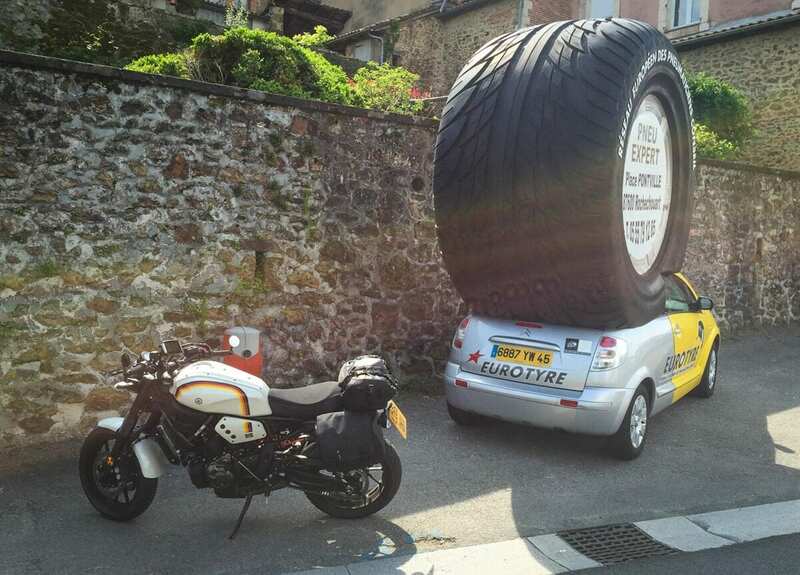 The brakes haven’t been fiddled with either. What does change the feel of the bike is the Yamaha single-seat, the Renthal Street Low Fat Bar and the K-Tech Suspension Razor-R shock. While I’ve had the XSR since the beginning of this year, it’s spent most of its time in my garage being tinkered with, or at CT Motorcycles having its paint done. The furthest I’d ridden it in one go was about 40 miles. As I set off, the tabloids were claiming France was running dry of fuel and that protestors were brining the country to a halt. With just a 14 litre tank, I figured I’d be good for about 150 miles, so packed a 2.5litre Givi jerry can in the pannier, and promised myself I’d fill up every 80 miles when across the pond. I was impressed on the ride down to Portsmouth that I got 61.8mpg – this would be the only motorway I intended to take on the trip, but travelling at 70-80mph, the gauge only started flashing on reserve at 146 miles. The display switched to a third trip, showing that I’d travelled 2.3 miles before stopping to refuel, where – if Yamaha’s spec sheet is to be trusted – there were still 3.1 litres remaining. 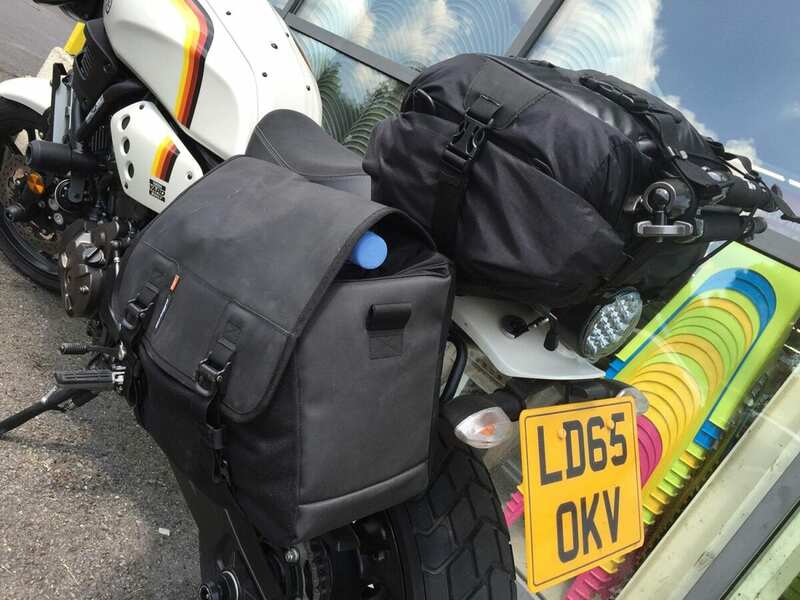 Thanks to a large laptop and the rest of my work kit I needed to carry, my Kriega R30 rucksack weighed 10.2kg – this, combined with my natural sensitivity in the cheek area and a firmish seat meant I had a bit of a numb bum by the time I reached Portsmouth 180 miles from home. But windblast hadn’t been an issue at all, and I’d been thoroughly impressed at the gearbox’s positive action. And that engine… it pulls so well from low revs that it’s easy to forget how much fun it can be when spun up from around 7000rpm to the limiter, just over 10,500rpm. It delivers a lovely, pulsing note (helped a great deal by the new exhaust), yet with no intrusive or uncomfortable vibrations – something that would prove the case throughout the ride. The huge amount of development that Yamaha put into producing this modular engine is proving well spent. I was happy with the low bars, which while wide didn’t make me feel like a sail on the motorway, and gave a wonderfully commanding riding position that I felt pretty smug about. Something that wouldn’t prove the case throughout the ride. 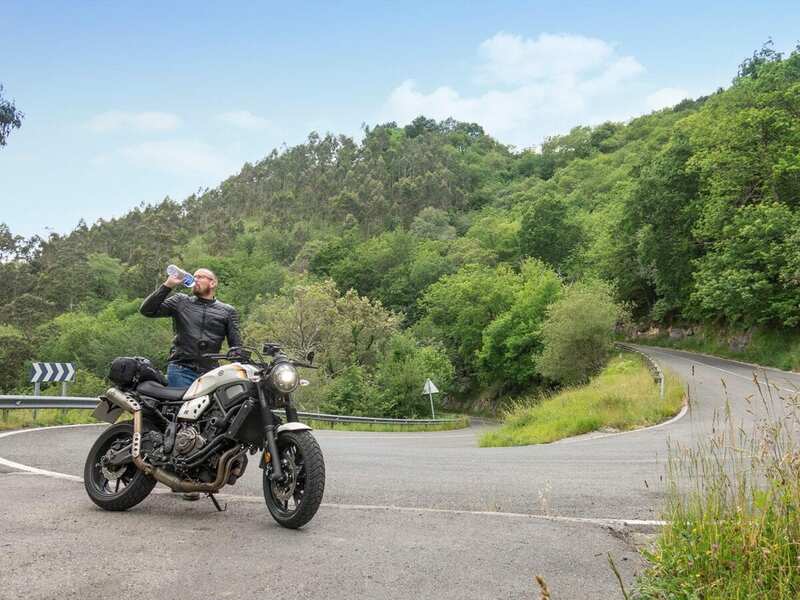 The Oberon-performance bar-end mirrors had given a great view – I’m not normally much of a fan, but they really complement the styling of the XSR now, completing a sleek, fairly flat top with the clocks moved down and forward, just above the headlight. This new position is far better than standard, making it quicker and easier to read the beautifully designed display. It’s no disaster on the original bike, and makes sense in many ways. What doesn’t is that the buttons are on the right – what maniac thought that was a good idea?! Whenever you flick between the two trips, time, air temp, oil temp, average fuel consumption and live, or the clock, your hand is covering the display. Add to the fact that to reset displays you have a limited time to see the digits flashing before once again pressing and holding a button, and it proves a bit distracting for use on the move. Positioned on the left, it would have been fine. Check-in for the Brittany Ferries overnight crossing to Caen was fast, efficient and friendly – just my ticket and passport were needed and I was through to holding in a few minutes. Far better than flying, and I had my bike with me. 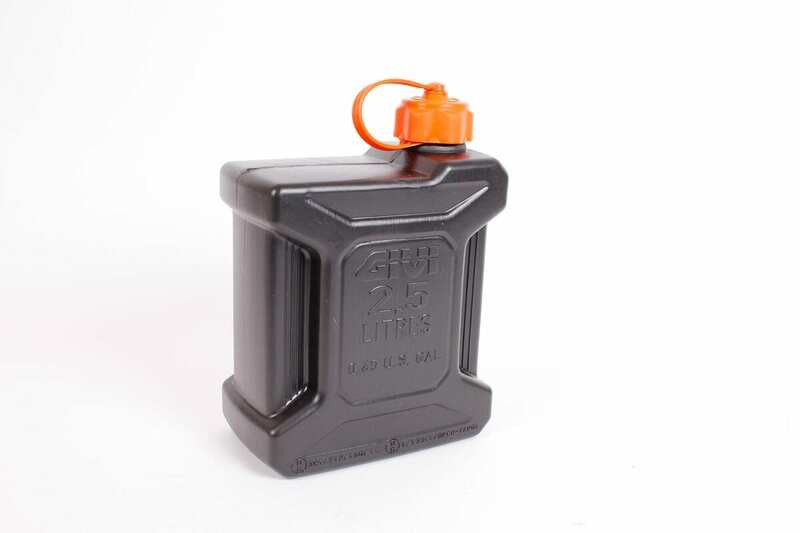 I met a gent with a Robin Hood kit car on the way to Le Mans – he too was nervous about the fuel, and with a tank range similar to my bike, he had a 20litre jerry can on board. Not so concerned was the recently-retired couple on pushbikes about to set off on La Velo Francette – an almost 400 mile ride to La Rochelle. They didn’t know how long it would take and they didn’t care… I was jealous of their freedom from deadlines. My four-berth cabin was compact, clean and comfortable with a shower and toilet ensuite. It’s the first time I’ve travelled overnight on a ferry, and while I would be woken by the ship’s music at 5.45am France time – an hour before docking and six hours after departure at 22.45 UK time – it was enough for a safe and comfortable ride onwards. The Loire river was very swollen, but still beautiful. I topped up again just 81 miles into France. It was foggy, and I’d been taking it easy on the smooth, sweeping roads, seeing a measured return of 62mpg. I’d stopped at one of the many automated stations that require just your card and PIN before you’re free to fill – my TomTom Rider showed the next station to be 35 miles away on my route (I could have searched for others off the track if I’d wanted), but while there was no 98 RON, 95 and diesel were fine. Riding for about three and a half hours, my bum was aching again at half ten, not helped by the stress of a ‘Deviation’ sign on my pre-programmed route. Usually I just tell the TomTom to find a ‘Winding Route’, but I had used Google Maps and street view to check I was off the dual carriageways as much as possible (and never going near a peage), before copying the web address into www.gpsvisualizer.com/convert_input to create a GPX file I could import to the sat-nav. Frustratingly, it was so long at 354 miles that the TomTom split it into two routes, making watching the time harder. More annoying was that when I did get diverted, in the half an hour it took me to find my way back to the route, the TomTom still hadn’t recalculated. It’s definitely a lot happier with routes it’s found itself. 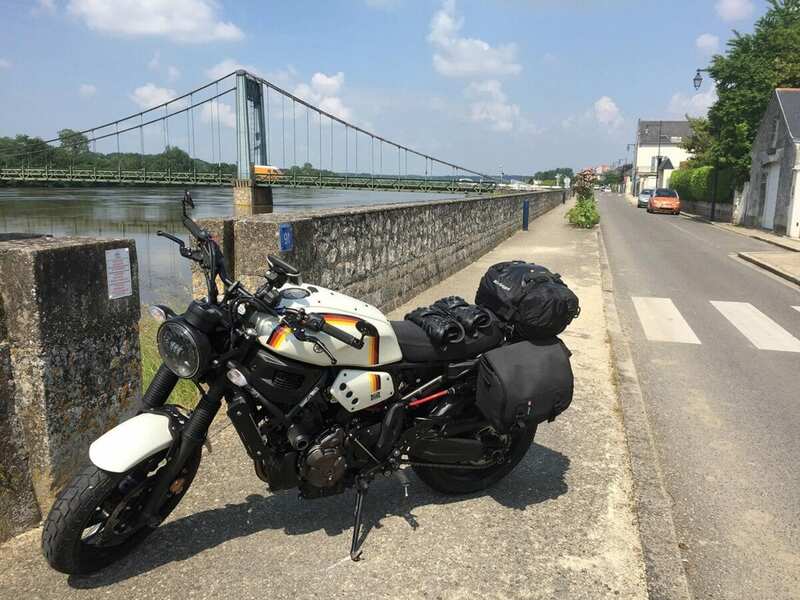 The D952 running alongside the Loire was beautiful – a 55mph road, but I found myself just pottering along at about 45mph, enjoying the scenery, the peace and the wind blowing across my face. The river was worryingly swollen, being the day after the Seine had risen a massive 6.1metres in Paris. As fuel had seemed fine at the stations I passed, I figured I could use more of the XSR’s impressive range. When I did finally stop I was faced with no fuel at all. I back-tracked to the last station… again, nothing. At 138 miles I filled up at another supermarket-owned auto station – with almost a gallon to spare I was impressed to find that the smooth, flowing ride had returned 68mpg. This bodes well for the Tracer 700’s 17 litre tank. The morning had been pleasant enough in the fog, but as the sun burned through, even the long, straight Roman roads were glorious with their huge expanses of green rolling hills. I should have stopped back at Les Rosiers-Sur-Loire for lunch, but pressed on, forgetting that the cafés only serve food for a limited time. 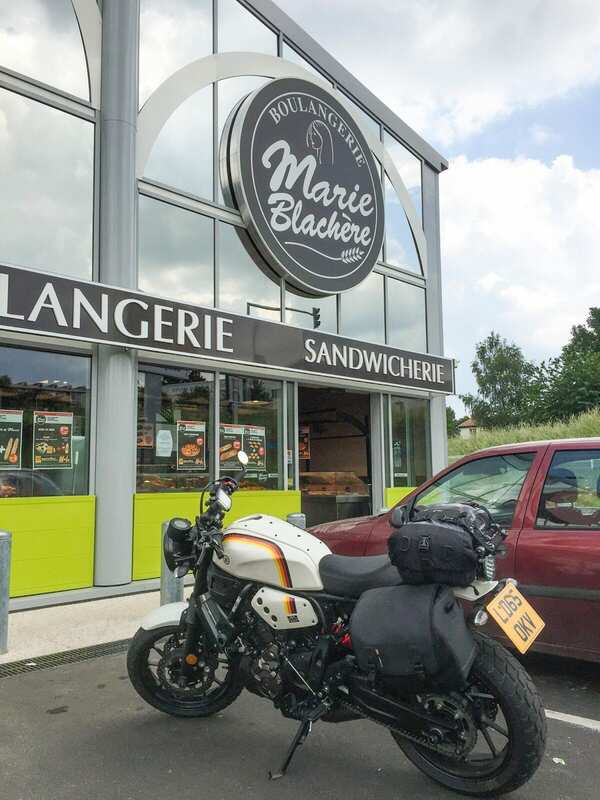 I stopped at a small village boulangerie, but it was closed for lunch(! ), and the bar in the square proved to only offer fags and coffee. By this point I was regretting forgetting my technical pants; an EDZ merino wool base layer top was keeping me comfortable, but my sweaty boxers were tearing at my skin. Eventually, I found a bakery in an industrial estate – not the view I was imagining for lunch, but suffering now, and with 120 miles to go, I had to stop. My legs ached from trying to raise myself off the saddle, and my forearms were starting to hurt from the weight of my body (and rucksack) being pushed forward onto the lower bars. While it doesn’t have a slip-assist clutch, the action is light enough, but the squared edges of the Evotech lever were also starting to make themselves known. An elderly lady who stopped to chat taught me that Biarritz is pronounced (quickly) Bee-urr-reets. My lack of language skills never fail to embarrass me. 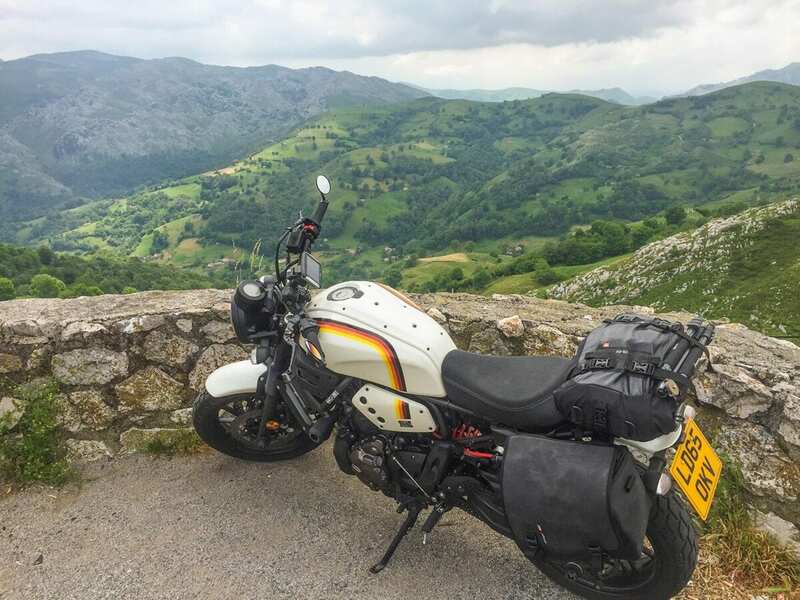 The bike would attract attention through the ride – from the other bikers at the port, through the teenagers sat in the street encouraging me to rev it to the bus-load of Spanish people drawn to it, taking photos on my final leg. 45 miles before I reached Le Moulin du Pont – the restaurant and hotel I would be spending the night at – I was really in pain, mostly due to my poor clothing choice. 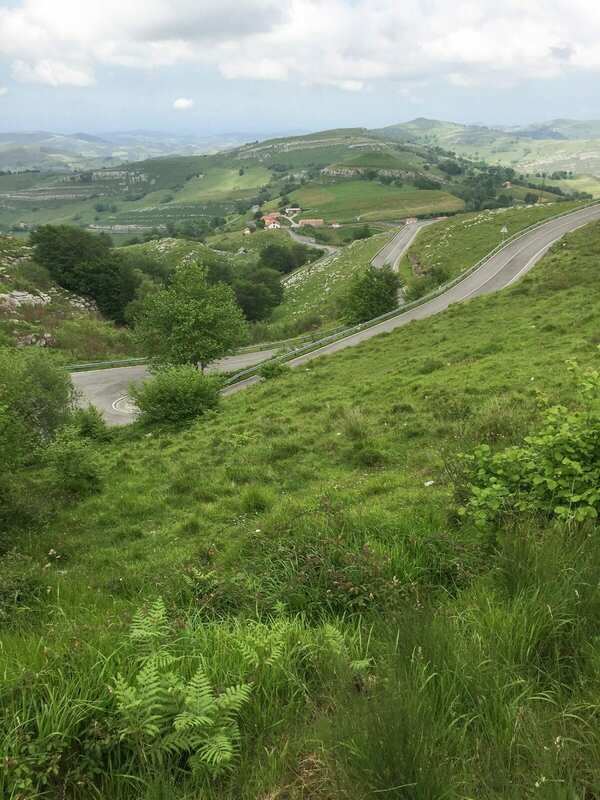 But the straight roads ceased, and I was faced with a wonderful run of sweeping, twisting bends that saw me moving around on the bike and forgetting the discomfort. The first day’s lunch stop wasn’t as romantic as I’d hoped. First stop the next morning was a pharmacy for a tub of talc and a pair of tights. I figured that the nylon would help stop my skin getting dragged. They also gave my legs a lovely cool feeling in the 34°C heat. My next day’s ride to Biarritz again took back-roads. Many were straight, but running though the Foret de la Double, it was fascinating and scenic ride. The dense forest was once home to those in hiding, but malaria was rife until monks drained the land for farming and to make it more habitable. 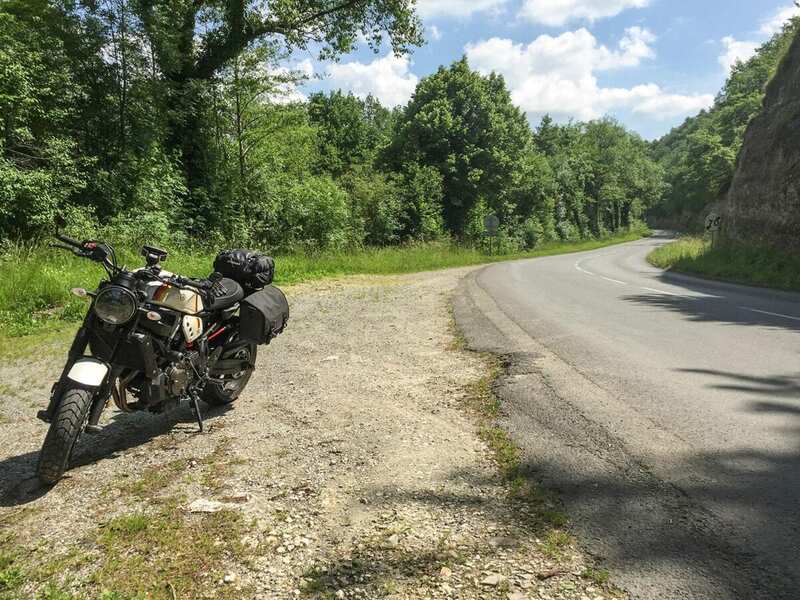 There are plenty of twisty, fun roads in France – this is just outside Lisle. The roads became progressively twistier, and I started riding a bit faster (especially when one enthusiastic local car driver was sat right behind me), but still the next fill showed an economy of 61mpg. During the ride I’d also had the chance to tweak the settings of the K-Tech shock – compression damping on the remote reservoir is easy to set while riding, and it took seconds to add a little more rebound damping. Sprung for my weight, I was able to really feel the changes, quickly finding the ideal settings for my weight and the average-surfaced roads I was riding. This rubber wouldn’t look out of place on a bike at Wheels & Waves. As standard, the XSR’s suspension – as that of the MT-07 – is okay, but push it harder and it can feel a little budget; not dangerous, but ‘confused’ is the best way I can put it. With the K-Tech shock the bike’s transformed, inspiring plenty of confidence, but also giving a very comfortable and compliant ride. The Pirelli MT60RS tyres also proved great, never once letting their knobbly appearance be felt on the Tarmac. They look the part, but with their slick edge feel secure and comfortable at all times. Even off road. At 34°C, plenty I tucked water bottles wherever I could. 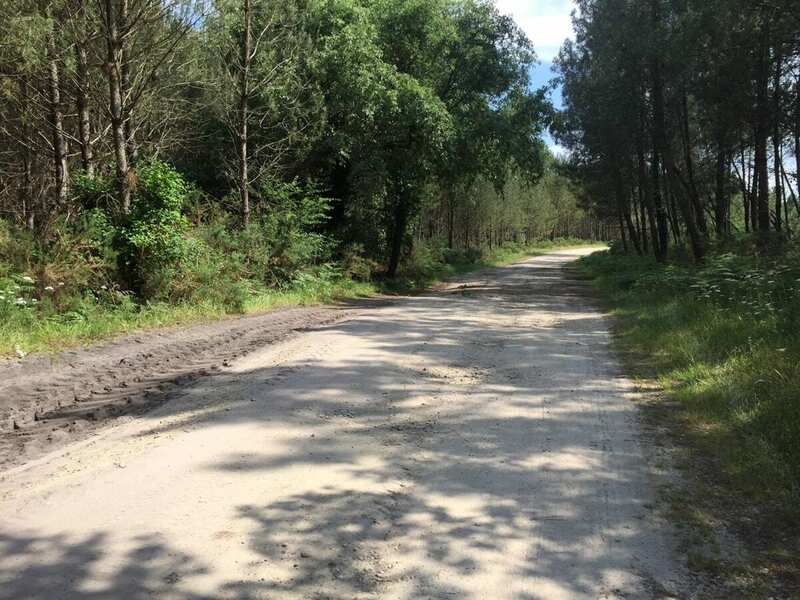 For some reason, my route took in a mile and a half of very dusty (like inch-deep sand at points), gravelly and pot-holed forest track. After tearing my rotator cuff on a dirt-bike, and knowing that Cada Día is due to be on Yamaha’s stand at Motorcycle Live this year, I was terrified of dropping it. I needn’t have been as cautious, but pottered along, dragging the back brake as I went, scared that I’d spin up the rear and dump the bike, or that maybe there will still criminals lurking in the woods. As I rejoined the Tarmac in the swealtering heat I was relieved. Until I realised I’d boiled the brake fluid. The very dusty track I found myself on proved the Pirellis to be more capable than me. It got progressively worse, until the point the rear stopper was all but useless. 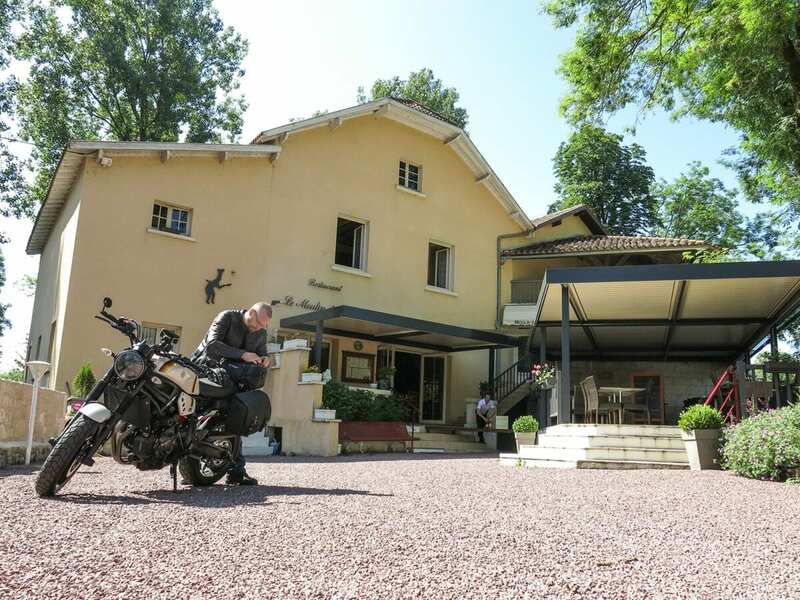 I ended up having to take it to a French Yamaha dealer (www.raffmoto.fr), where a lot of sign-language eventually led to them changing the fluid for 25 Euros. 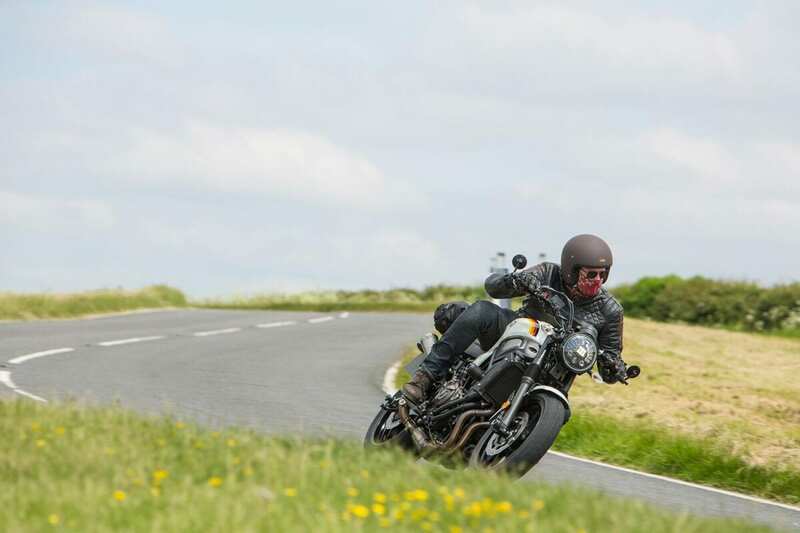 I tend to use the back brake a fair bit, and having ridden an MT-07 in the heat of Lanzarote – which has the same parts – I know it’s not a fault of the Yamaha. I met a BMW rider on the way home who’d cooked his too, though fortunately his had returned. 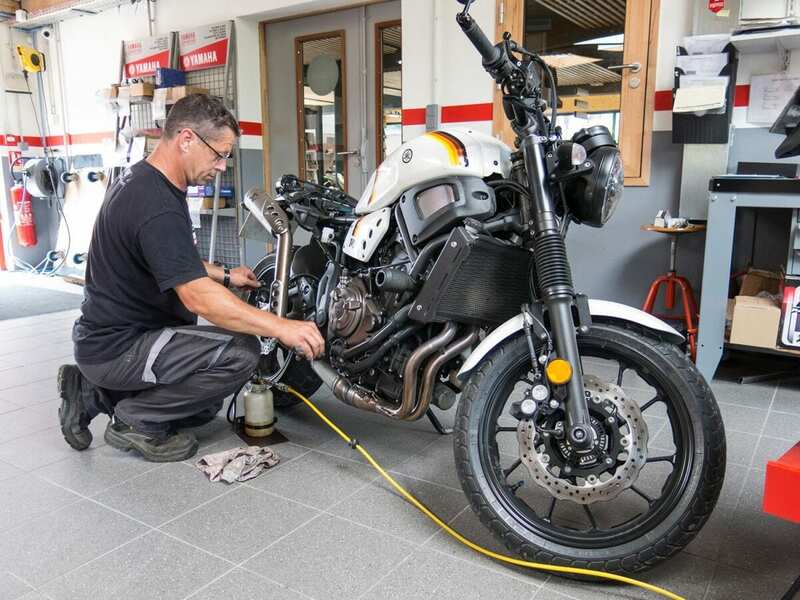 The XSR gets new rear brake fluid at Raff Moto in Biarritz. Filling up again near Biarritz I found I’d managed 66.6mpg as I chatted to a T100 Bonneville rider from Belgium, also on his way to the festival. It’s the details that have been proving the biggest draw to others – some pick up on the mirrors, some the fork gaiters, and many the cornering headlight. All seem to love the paint, but it was common for people to think that the Yard Built colours were German. 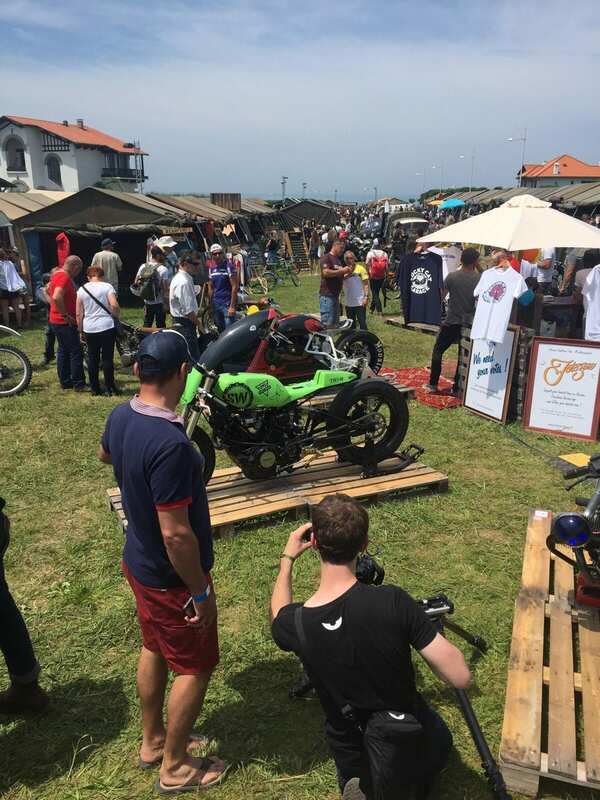 Wheels & Waves is simply a bike show, like any other. It might not be as big, or as well organised as something like Motorcycle Live but it is, simply, a large group of people enjoying bikes. Visitors come from all over on everything from stock R1200GSs to the most ludicrous custom machines. 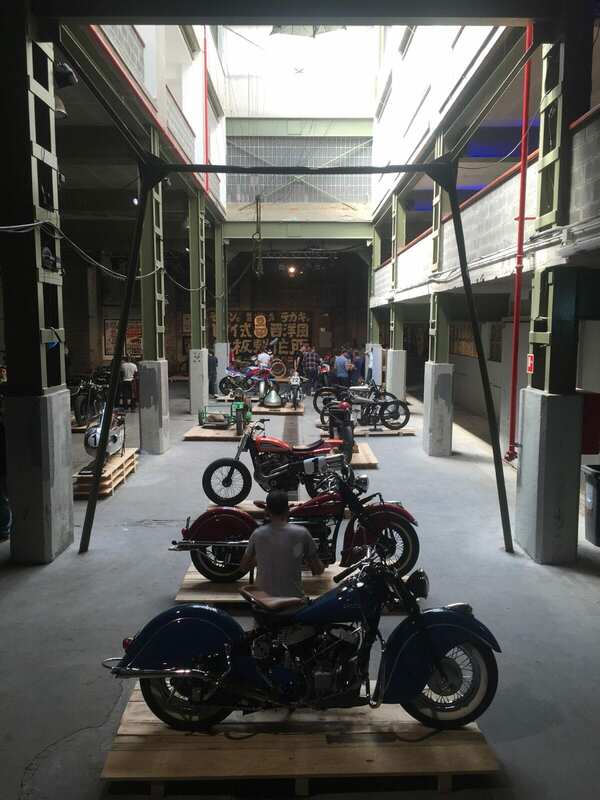 Besides the custom builders, Royal Enfield, Moto Guzzi, BMW, Yamaha, Triumph and Harley-Davidson all had stands there, along with the likes of Davida, Alpine Stars and Rev’It. 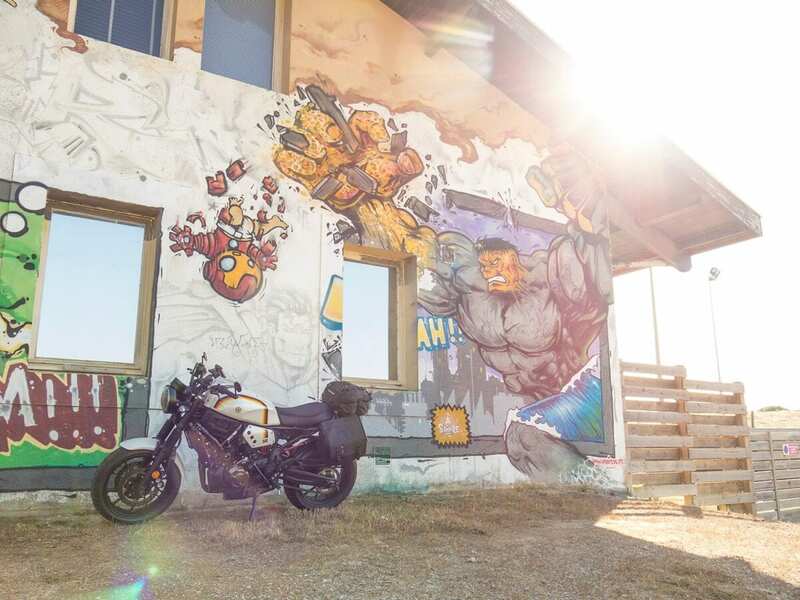 It might appear niche, with some of the more extreme fans dressed in what’s best described as less traditional biker wear, but make no mistake – the custom scene is shaping many of the motorcycles being produced (R-Nine T, Harley’s Dark Customs, the XSRs…), and it’s encouraging a younger audience into biking. If you’re in the area next year, it’s worth a visit. If you’re not interested in the eclectic mix of bikes on display, I wouldn’t say it’s worth a ride from the UK, but the ride itself is worth every minute. And the trip from Biarritz to Santander was even better. 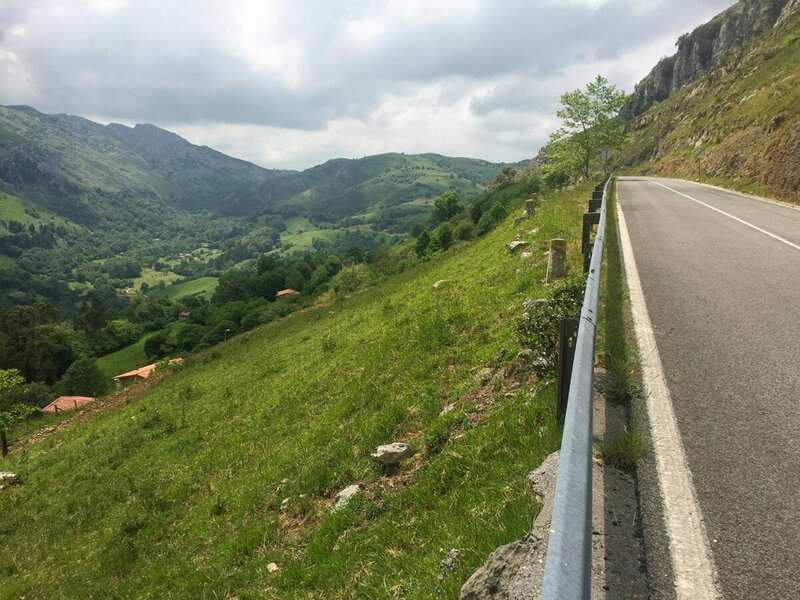 Spain has some phenomenal roads, and while I only had one day to make my way to the port for the ferry home, I’d planned a winding route all the way. In the morning though it was raining heavily, so I programmed the fastest route possible to Zarautz, where I guessed the rain would have stopped. It had, and at first I was disappointed with the ride, taking in far too many industrial areas. But then I went through the centre of Bilbao, with its beautiful architecture, before 30 miles of the most amazing, smooth, twisting and rolling roads thanks to the BI-630. This was what I’d come for – this was what I’d built Cada Día for. Without the modifications the XSR would have been a brilliantly capable machine. With them, it was MY brilliantly capable machine. I’m writing this from my bright, spacious four-berth cabin on Brittany’s Cap Finistére. I can feel myself starting to seize up as the adrenaline wears off, but it’s been a great trip. 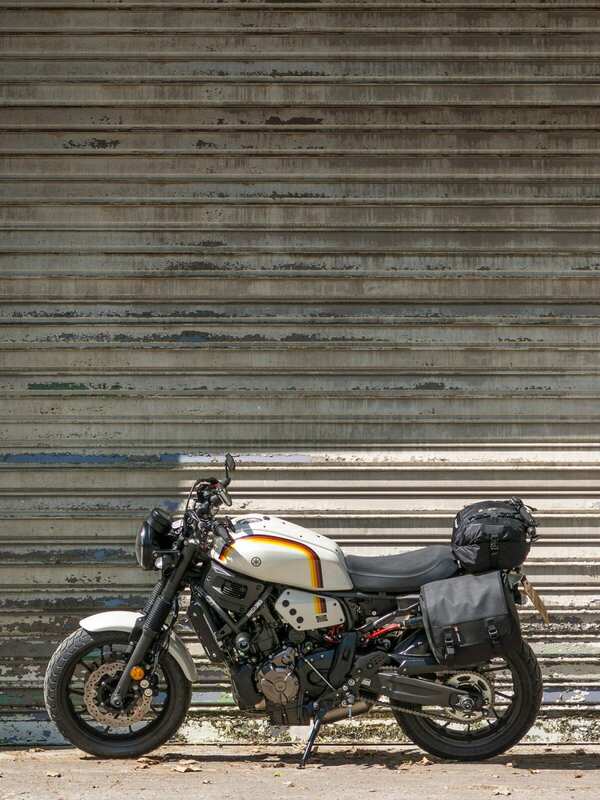 Two questions now need answering (three if you count whether my wife should be worried about the tights): Firstly, in building Cada Día have I succeeded in producing a practical, everyday custom machine, and secondly, is the XSR a good base for you and I to create something personal? While I probably wouldn’t rush to spend nine hours in the saddle again, I think this bike has worked out well. The lower bars do put a little more weight on your wrists and forearms than standard, but they make for an even more nimble ride in twisty roads, which is where it’s most likely to spend the majority of its time. The handling is excellent with the new shock, the engine superb, and the brakes fine. I’m considering using a one-tooth-smaller front sprocket for more acceleration, but that could come at the cost of economy and higher-speed comfort. As a platform the XSR is brilliant. By removing many of the hurdles custom builders face (like wiring packed into the headlight, or a fixed rear sub-frame), Yamaha has made a machine that can be tweaked as little or as much as you want. There’s already good support from accessory companies, and as I hope I’ve proved, with a few home tools it’s possible to create the bike you want. It’s great out of the crate, but if you want to personalise it you can, and it needn’t cost the earth. 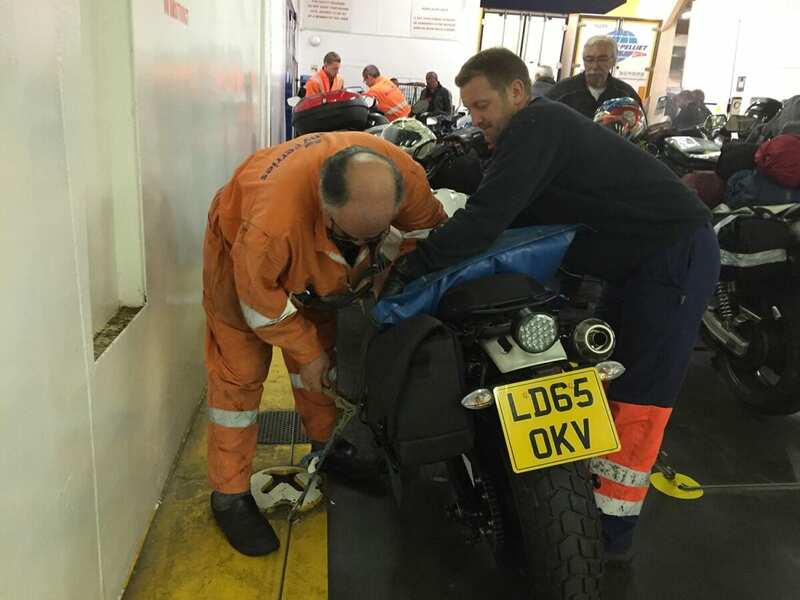 Bikes are strapped down for you in the ferry using well-maintained straps and pads. I sailed with Brittany Ferries from Portsmouth to Caen on the Normandie, setting off at 22:45 and arriving at 06:45 local time. There are three sailings a day, starting at £52, but this gave me a full day of riding, while the large two/four-berth cabin guaranteed plenty of space to spread out my kit and rest. Sharing with a friend would still have given us plenty of room for our gear. Early in June, the crossing cost £59, while the cabin was £75. Smaller one/two berth cabins are also available, or a reserved lounge seat costs £5. My return journey on the Cap Finistére cost £172 for the crossing and £115 for the cabin. Again, smaller cabins are available, or a reclining seat is just £10. On both trips, my bike was well secured for me using a large strap and very thick pad. Both cabins were very clean and comfortable, with en-suite toilet and shower. The return crossing was on a larger ship, with the cabin and shower even bigger, and also offering two power sockets. There are up to seven weekly return crossings from the UK to Spain, departing from Portsmouth or Plymouth and travelling to Santander or Bilbao in around 24 hours. Prices start from just £124 each way for a motorcycle and rider, with a two-berth cabin from £85 or a reclining seat just £10. For more information or to book, visit www.brittanyferries.co.uk or call 0330 159 7000. I spent my first night in Lisle, at the superb Moulin de Pont gourmet restaurant and accommodation. A favourite of my wife and I, the food is incredible, the reception always very welcoming, and prices extremely reasonable. Located on the river Dronne next to a beautiful dam, food is cooked with ingredients from the Périgord region. The wonderfully quiet spot also has garaged parking for bikes if you want to use it. www.moulin-du-pont.com / +335 53 04 51 75. In Biarritz I stayed at the very friendly and comfortable Hotel Mirano – www.hotel-mirano-biarritz.fr / +335 59 23 11 63. Bikes are safe outside, or can be shuffled into the courtyard, and while only breakfast is available, the busy town centre is just a 15 minute walk away. What’s it cost to insure? I spoke to Principal Insurance (www.principalinsurance.co.uk / 0330 024 0087), who specialise in giving a very personal and bespoke service, so would be happy to take the time to look at the implications of all the modifications. I’m 43 years old with maximum no-claims bonus of nine years, and have had no accidents, claims or convictions. Based on 5000 miles of commuting and pleasure use, with the option to take a pillion, the bike would be garaged overnight. A standard XSR700 with comprehensive cover would cost me £117.23, with a £350 excess. Running through all the modifications, the same underwriter would be happy to cover it, though would increase the total value to £12,000. This gave me a quote of just £155.10, with a £400 excess. 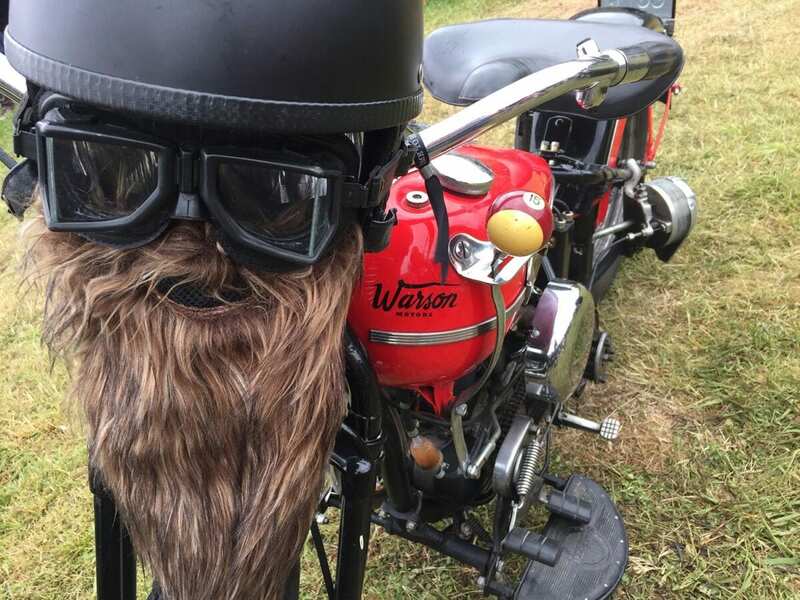 Unless you’re making engine modifications or having an extreme paint job done, it’s clear that a bike can be modified to suit yourself without having too much of a detrimental effect on your policy. A 2.5 litre Givi jerry can proved to be unnecessary, but it gave me good peace of mind.